“Art is good, but craft will see you through,” is a motto Riehl recommends for all creatives. “Our muse comes when we’re at work.” The trick then, is to keep ourselves at work, as happily as possible. Creative Catalyst gives you seed thoughts, activities, and tips to keep your hand moving even when your brain or your life seems paused. You may write to Creative Catalyst with questions and concerns for Janet to respond to. Janet Grace Riehl is an award-winning author, blogger, and conference presenter living in St. Louis. 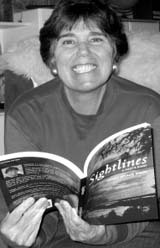 Sightlines: A Poet’s Diary is her down home family love story beyond death, told in story poems. Twice selected as finalist for Poet Laureate of Lake County, California and a member of Authors Guild, her poems, stories, and essays are published in national literary magazines, including Harvard Review and Cream City Review, and several anthologies. Her blog “Riehl Life: Village Wisdom for the 21st Century” is dedicated to creating connections through the arts and across cultures.